The Classicist is an annual peer-reviewed journal published by the Institute of Classical Architecture & Art and providing a venue for scholarship related to the classical tradition in architecture and the allied arts, a forum for current classical practice, and a source of information and inspiration for students, practitioners, teachers, patrons, and lovers of classical art and architecture. Each issue addresses a theme with essays on relevant topics, a selection of current professional and academic work, and open discussion of critical topics from multiple perspectives within the field. The current issue, as well as many if not all past issues, are available for purchase via the links below or at the Classicist Bookshop. The Classicist is an annual peer-reviewed journal dedicated to advancing the mission of the Institute of Classical Architecture & Art by providing a venue for scholarship related to the classical tradition in architecture and the allied arts, a forum for current classical practice, and a source of information and inspiration for students, practitioners, teachers, patrons, and lovers of classical art and architecture. Volume No. 11, edited by Steven W. Semes, features scholarly essays dealing with historical practice, international portfolios of current work by professionals and students, and book reviews. The content ranges from urban design to individual buildings, to decorative arts and gardens. The journal is extensively illustrated, with many images in color, and will appeal to specialists and non-specialists alike. Click here to visit the Antique Collectors’ Club website and order copies of The Classicist. Now in its tenth issue, The Classicist continues to serve as an inspiration for professionals, academics, and enthusiasts alike. This volume, edited by Dr. Richard John, is richly illustrated with drawings, photographs, renderings, watercolors, and details in full color. Essays include contributions by Jana Vandergoot on the traditions of ‘urban food’ in Rome and Paul Gunther on the stunning work produced by the ICAA’s Beaux-Arts Atelier and Grand Central Academy of Art. The work of other schools is also represented through student portfolios from the University of Bologna, Notre Dame, Yale, Judson, Miami, the American College of Building Arts, and The Prince’s Foundation for Building Community. A wide range of professional work from across the country is featured in the “From the Offices” portfolio, reflecting regional application of traditional and classical forms. The Classicist No. 8 is the first issue of ICAA’s award-winning scholarly journal to be edited by Dr. Richard John and is also the first to be published in full color. It includes essays by Richard Economakis on George Whitmore’s Palace in Corfu, Ralph Muldrow on Albert Simons, Katherine Wheeler on Sir Reginald Blomfield, Denis McNamara on Leonard Porter, and the late Charles Barrett on Schinkel’s Schauspielhaus. In addition there are contributions by Andrés Duany on the “New Canon,” Richard Cameron on “Imagination and the Sketch,” and Elizabeth Meredith Dowling on the history of architectural education at Georgia Tech. The work of other schools is also represented through student portfolios from Notre Dame, Yale, Judson, the Prince’s Foundation, Miami, the American College of Building Arts, the Grand Central Academy, and ICAA. To order copies, please call (212) 730-9646. Available in January 2008, this issue focuses on the civic realm and includes essays by Francis Morrone, David Mayernik, and Dino Marcantonio, as well as portfolios of student and professional work. No. 7 features a cover drawing by architectural renderer, Andre Junget, which celebrates the ingenuity of Grand Central Station engineer William Wilgus. Selections from this issue include: Essays by Leon Krier on Ayn Rand, Robert Gilkey Dyck on Plecnik, and Catesby Leigh on Goethe and the Organic Fallacy; projects by Cooper Robertson, Eric Watson, Carden & Godfrey, and Robert A. M. Stern; competition entries for the New Town Center for the Village of Plainfield, IL, the Oklahoma City Memorial, and the Royal Oaks Center; the Sketchbooks of Milton Grenfell; Kanchan Limaye on the State of the Allied Arts; and a bibliography of literature on the classical interior. The fourth issue of the award-winning journal of contemporary classicism, this number of The Classicist features articles by Elizabeth Meredith Dowling, J. François Gabriel, and John W. Stamper; projects by Julien Bicknell, Curtis & Windham, Ferguson Shamamian & Rattner, Ken Tate, David Anthony Easton, and others; portfolios of recent competitions and student projects; the sketchbooks of Frank Montana; and work by contemporary sculptors. This greatly enlarged volume encompasses topics from the new urbanism to contemporary landscape design to the impact of the computer revolution on classical art and architecture today. Featured essays include Phillip Bess on the New Urbanism; Mark Hewitt on early 20th century renderers; and David Netto on Rosario Candela. The Professional Portfolio highlights garden and landscape design, including the work of Deborah Nevins. Among the other features is a synopsis of the major architectural treatises essential for the well-stocked library. The follow-up to a successful debut issue, Volume 2 features writings by Ingrid Rowland, David Watkin, Hugh Petter, and Ernest Flagg. Essays include Pierce Rice on drawing from the antique and a previously unpublished lecture by the 19th century architect, C. R. Cockrell. The Professional Portfolio features the work of Robert Adam, David Easton, Ernesto Buch, Arthur May, and Leon Krier. The inaugural issue of the Institute’s annual journal features essays by the architectural historians Caroll William Westfall and John E. Hancock, writer and urbanist James Howard Kunstler, and critic Mark Helprin. In addition, projects by Robert A. M. Stern, John Blatteau, Bunny Williams, and Ferguson Murray & Shamamian are showcased. The classical paintings of Edward Schmidt and David Ligare are reviewed in the Allied Arts section. 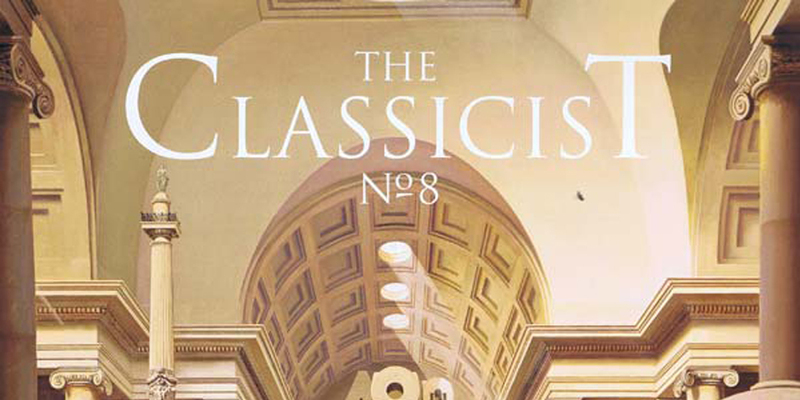 Selected articles available online, visit The Classicist No.1 Archive.